Happy Monday! I had a quiet weekend and didn't do much of anything, which is fine by me. I have 12 hour work days today and tomorrow. I'm not sure what's going on later this week...just trying to get through the next two days. I like to think that I'm a pretty friendly person, but I know there are people that I encounter on a regular basis who are not the most pleasant to deal with. 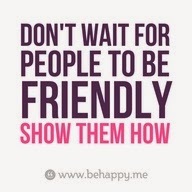 While I am polite to them, I do not go out of my way to be friendly and I minimize my interactions with them. This week, I am going to make a point to be friendly to these people. Sew Crafty Angel's Birthday Giveaway!